What is a Weekday Lodger Agreement? When the room is and isn't available. "House rules" - what is expected in terms cleaning etc. Why do I Need a Lodger Agreement? It's common sense to have a written agreement in place before allowing a lodger to move in. An agreement not only protects you and your property but also helps avoid any disagreements later on. What Areas Does the Agreement Cover? 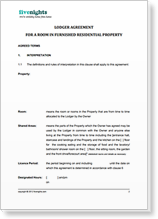 The lodger agreement covers letting in England and Wales. Our agreement is available for free, unlimited download to our premium members, or for a one-off fee of £14.95 to basic or non-members.